Home / biz / business / business news / economy / economy news / finance / financial news / money / Cyber security – should your business be worried? As our reliance on technology evolves, questions around data and privacy come to the fore. In recent years, this has also seen an increased prevalence of cyber-related crimes. As awareness around cybercrime grows, business owners are tasked with assessing the impact data breaches and cybercrime would have on their businesses, but what exactly is the threat to businesses and what can be done to mitigate the risk? It has been reported that one in ten businesses in the UK will become the victim of cybercrime. With most reports in the news covering security breaches at big firms, it is a common misapprehension that start-ups and small to medium-sized businesses are absolved from risk. 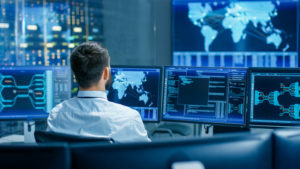 The reality is that every business has the potential to fall into the sights of cyber criminals, with smaller enterprises often providing a soft target. Globally, cybercrime and data breaches have cost businesses billions in recent years. On an individual level, businesses that fail to take heed of the risk and institute precautions against breaches stand to severely damage or even prove fatal to businesses with little to no warning. The days of turning a blind eye to cyber security are over. Every business owner needs to acknowledge that their digital processes, data, and client information are all exposed to the threat of cybercrime, opening you up to liability and fines. Busy business owners rarely have the time and resources to invest in obtaining specialist advice and security measures around their data – and hackers know this. Phishing, ransomware, and worms – to name a few – are ever-evolving and grow in intelligence over time. There are a number of steps business owners can take around their cyber security. With many cyber crimes occurring as the result of non-malicious internal human error, business owners should generate awareness and educate staff around security best practices. It is also worth implementing a cyber security and disaster recovery strategy. A data breach can have far-reaching repercussions for businesses. In the event of a breach, commercial cyber insurance can stand to alleviate the burden and cover the hefty financial consequences around this event. In meeting their clients’ sophisticated business needs, Smarter Business has added cyber insurance to their suite of business services. Powered by James Hallam – trusted for commercial insurance solutions for over 30 years – Smarter Business provides portfolios tailored to the individual risks of businesses. To discuss the best cover for your business at the best price, contact Smarter Business here.